CANTON, MA (November 18, 2015) — Dunkin’ Donuts, recognized for keeping America running by serving its entire menu all day long, today announced two programs that will make it even easier and more convenient for people to run on Dunkin’ from morning to night. Starting this week, Dunkin’ Donuts will begin testing mobile On-the-Go Ordering in Portland, Maine and Dunkin’ Delivery in Dallas, Texas. In the coming weeks, Dunkin’ Delivery will also be available in Atlanta, Chicago, Los Angeles and Washington D.C. In Portland, Maine, members of the DD Perks® Rewards Program can get their favorite Dunkin’ Donuts menu items even faster when they download the new Dunkin’ Donuts On-the-Go Ordering app DD On-the-Go Ordering Portland, which enables guests to order in advance using their mobile phone, skip the line and go straight to pick up when they get inside the store. Guests can also pick up their mobile order at the drive-thru. Guests can place a mobile order up to 24 hours in advance, then simply confirm via the app when they are at the selected restaurant and ready to pick up their order. To learn more about the app and On-the-Go Ordering, visit www.DDPerks.com/OnTheGo or download the app here. With Dunkin’ Delivery, Dallas-area residents can use on-demand delivery service DoorDash to order their favorite Dunkin’ Donuts products with the click of a button, without leaving home or work. From 7 a.m. – 10 p.m., people can select and purchase their favorite Dunkin’ Donuts menu items, including a wide array of signature coffee, donuts, sandwiches and more, and have the products delivered in less than forty five minutes. In the coming weeks, Dunkin’ Donuts will also partner with DoorDash to offer delivery service in Atlanta, Chicago, Los Angeles and Washington D.C. Mobile On-the-Go Ordering provides an exciting new benefit for DD Perks members. 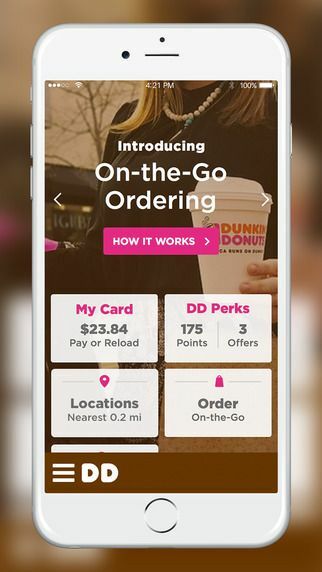 With DD Perks, guests already earn five points for every dollar they spend on qualifying purchases at Dunkin’ Donuts when they pay using an enrolled Dunkin’ Donuts Card, either plastic or via the Dunkin’ Mobile App. Once a member accrues 200 points, he or she receives a coupon for a free, any-size beverage of their choice, redeemable at participating Dunkin’ Donuts restaurants. DD Perks members also receive a coupon for a free, any-size beverage upon enrollment and on their birthday. To enroll in DD Perks, download the Dunkin’ Mobile App or visit www.DDPerks.com.